A huge thanks to Behr who generously supplied paint for this project. All opinions of this fabulous and beautiful paint are completely my own; you can read my full disclosures here! One thing I knew I wanted to do from the beginning is to paint our tiny “blah” vanity. It’s the typical boring builder grade light oak wood and it desperately needed a little face lift. There’s absolutely nothing wrong with wood vanities, it’s just not my style. I looked all over Pinterest for inspiration, and decided on a darker gray color to compliment the newly painted light gray walls. I’ve seen a ton of tutorials on painting vanities, but I really really really didn’t want to have to sand, sand, sand, prime, sand, prime, sand, paint, paint paint. Okay, fine, it may not be that much work, but still. I wanted to find an easier way to get ‘er done without a ton of work involved. Yes, you could even call me “lazy” for this project. But hey, I only wanted to paint while Jade was sleeping so that left me with naptimes and after she went to bed. The lighting isn’t very good at all after bedtime, so naptime was it. Even though it was such an easy project, it still took almost a week of naps to complete! Not terrible, but not really “me,” either. I wanted a little color, even if it was gray! 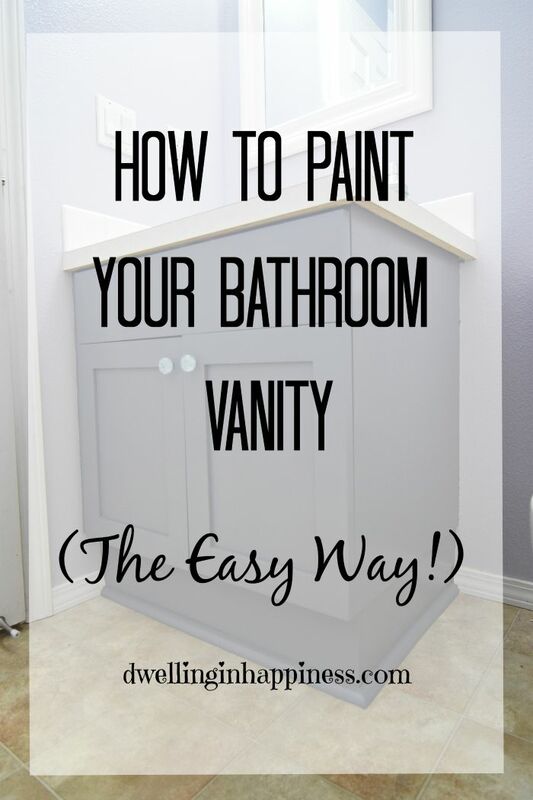 So, what made painting the vanity so easy, you ask? Let me share. 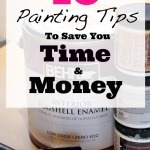 Have you heard of or used Behr paint? Friend, you’re missing out if you haven’t! They have a fabulous line of paint called Marquee, and boy, it gets the job done. 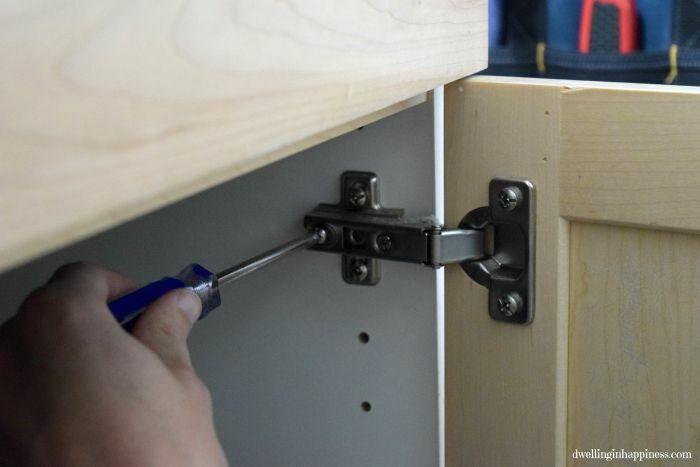 Not only does it go on super smoothly, it’s a paint and primer in one! 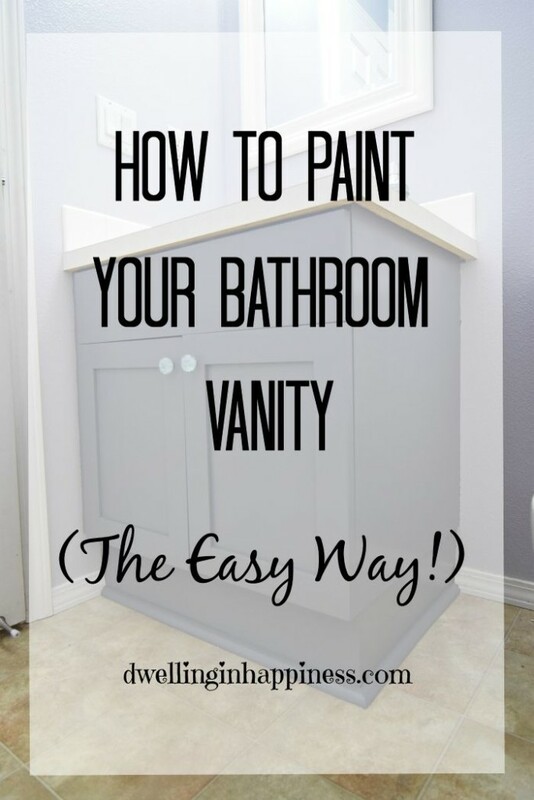 Do you know how much easier that makes a process like painting the vanity? The Marquee line also has superior stain resistance, with an easy-to clean surface. Behr is so sure you’ll love their paint that they back it up with a lifetime guarantee! Now that’s my kind of company. 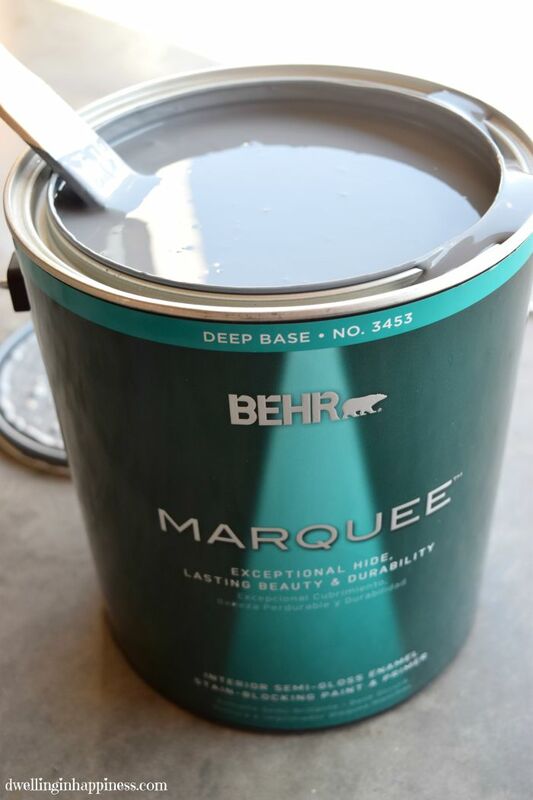 Paint 3 light coats of your favorite Behr Marquee color. I My hubby started by taking off the cabinet doors and our faux drawer on top (which is just a wood panel). 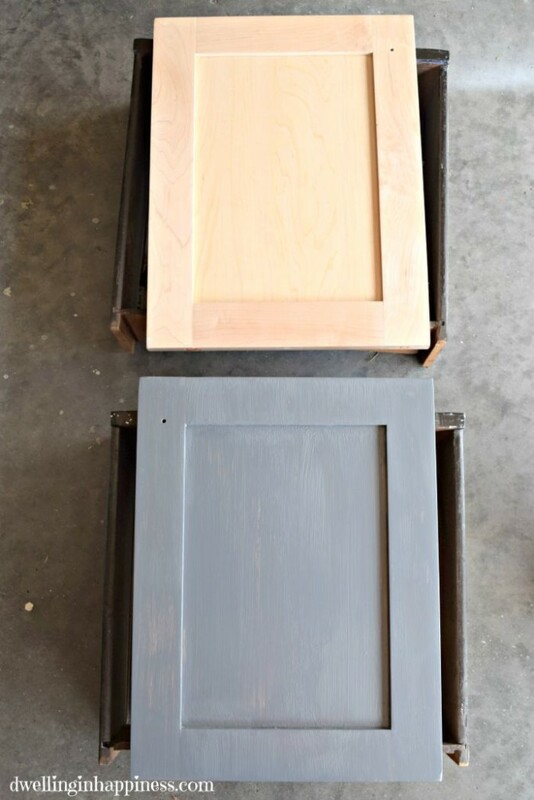 Then, I took off the handles and very lightly gave each door (front and back) a light sanding. This is really just to help scratch the surface so the paint will stick even better. You may not even need this step, but I really wanted to make sure the paint would adhere. I wiped the doors down with a wet cloth to get off any dust, dirt, and grime. Using a foam brush, I started lightly brushing on the paint. I chose Antique Tin in a semi-gloss finish as the color. For a bathroom, the shinier the better. The semi-gloss will help against knicks and traffic, as our guest bathroom is primarily used by Jade. Now as I said above, I did three coats. You could definitely do one coat, since Behr’s Marquee line is made to do just that; but I found that one thick coat would show more brush strokes than I wanted for this project, so I just did three very light coats instead. After one door, I was totally in love! It looks a little lighter here since it’s one coat and still wet, but I loved it so much more than the plain wood. 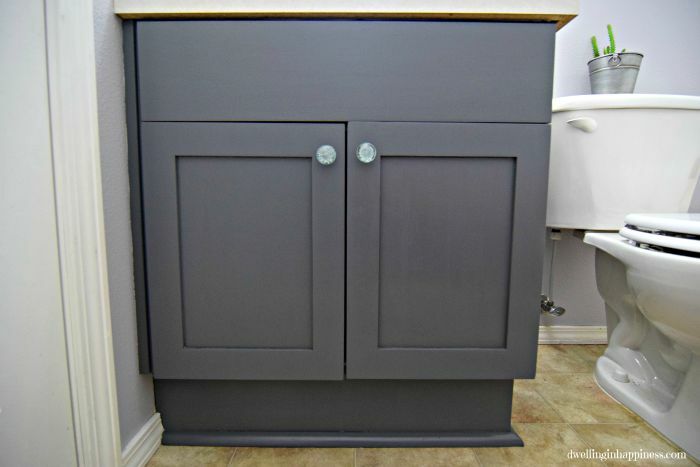 While the cabinet doors and faux drawer were drying, I very lightly sanded the vanity in the bathroom, wiped it down with a wet towel, and then taped it all off with frog tape (ps, do you see the pretty gray walls?! I heart them so much! You’ll see why when you see the before pictures…). I also used a drop cloth under me to catch any drips while I painted, but I didn’t tape it down. Holy moly, please excuse the mess under the sink. Someone needs to do a little organizing, eh? I’ll add that to my ever-growing list of things to do! Then, I got to painting! Again, I started with one very light layer. As they dried (over a period of a couple of days) I did two more super light coats for a total of 3. After the vanity was just about dry, I carefully pulled off the tape. 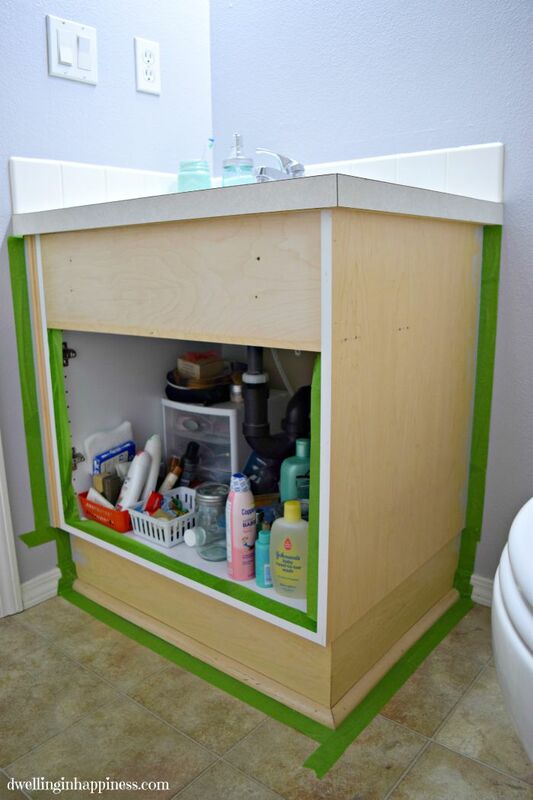 TIP: Use an x-acto knife to score the tape along the wall ad vanity. It will pull up much easier and not take any paint from the vanity with it! David added the doors back on for me. Instead of putting the plain silver knob back on, I used 2 pretty glass knobs leftover from when I turned a dresser into our entryway table! They were the perfect color to match the decor, so on they went. Aren’t they pretty?! 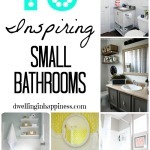 And now, for some pretty after photos (except for the lighting; there’s no natural light in this tiny bathroom!)! So much better. What do you think? Have (or would!) 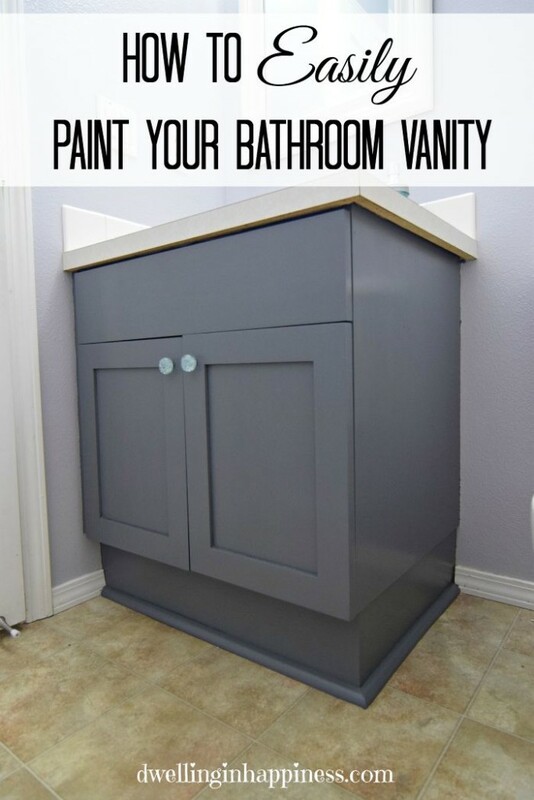 you painted your bathroom vanity before? Do you have any other tips on what worked well for you? Have such a great week, friends! Hey, Amanda ~ Your vanity looks so amazing, and I love that color! And that paint looks so smooth! I have been wanting to paint all of the vanities in our bathrooms, but the sand forever then paint thing was just too overwhelming! But now that I know the easy way, I’m adding this to the “Do ASAP” list! Aw thank you so much, Tiffany! I’m so in love with the color too, I was a little afraid it’d be too dark, but it’s not too bad! Yes the sanding forever totally turned me off, but this paint changed all that! Totally worth the job and time. 🙂 Have a great rest of the week! It is lovely and I like the color too ! But I was wondering if your doors are a little off though as the right one looks higher than the left in the “after” photo ! Not knocking your job at all and it could just be my eyes !! Did you paint the inside of the doors? What’s the name of the color you painted the bathroom vanity. What s the name of the color you used. I’ve purchased a few and just not seeing one I like. But am I love with yours. Thanks. 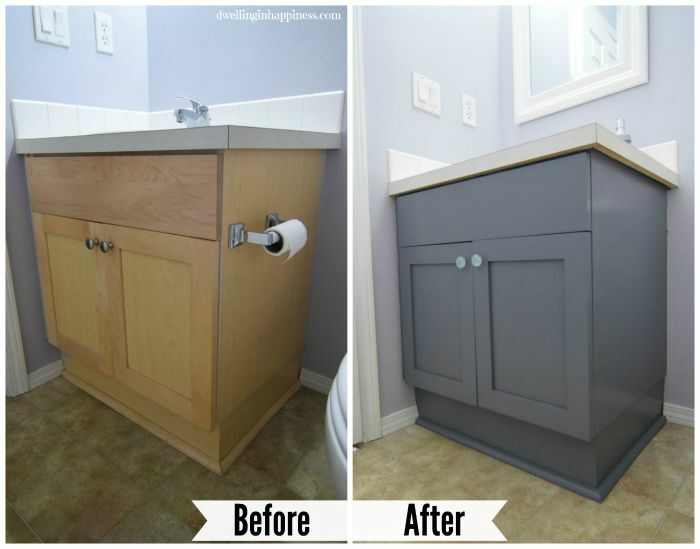 So excited to see your master bathroom vanity paint makeover! It turned out GREAT! I am in love with those knobs. I am now thinking of painting my daughters furniture and I am so excited to pick out the knobs (the best part IMHO!!!!). Wow, it turned out beautifully and so smooth! 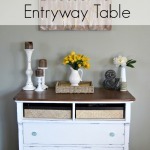 I’m gearing up to paint our vanity in a couple months, so will have to look into that paint! Oh and those knobs are gorgeous! In love with the color you chose! It looks so much better now. I like the pretty knobs too! Thanks, Amy!! I’m so happy with the color too, waaay better. 🙂 Hope you’re having a fab week! Looks awesome, Amanda! I’m not a fan of the light oak either and LOVE the new grey! 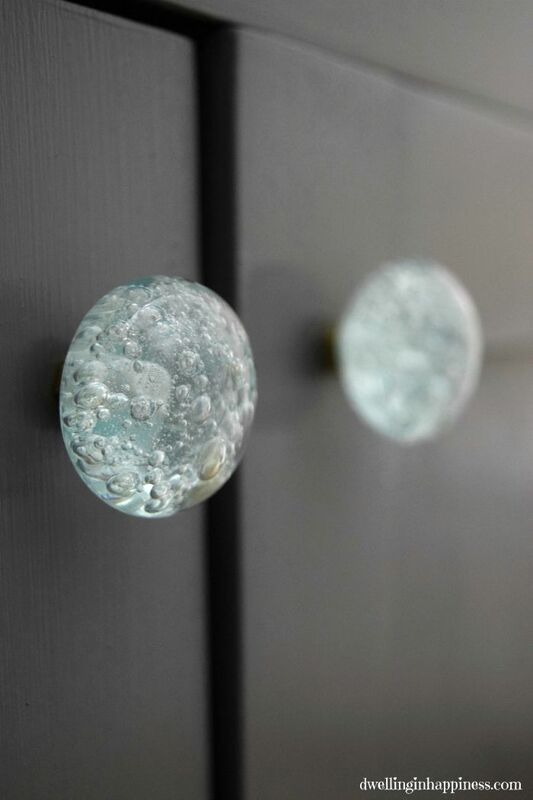 And the knobs are soo pretty! Great job! (and I think I’d give you a good run for your money with being the most indecisive person ever!) lol! 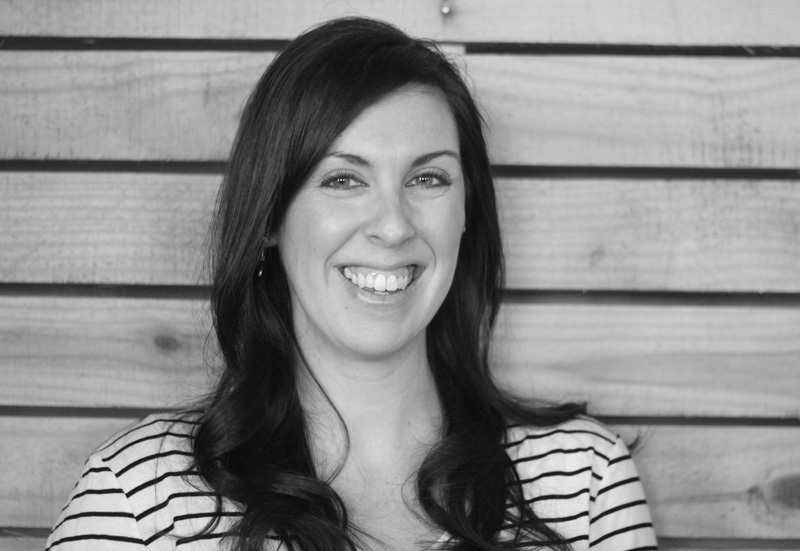 Thanks, Kendra! I love it too, it’s such an upgrade! Ha! I’m totally indecisive, and probable one of the worst!!! 🙂 Hope you have a lovely weekend! I just started painting my furniture this week. I love the color you used. I love the new color. Definitely makes it look more custom than before. Erlene recently posted…Merry Monday Link Party #66 – Ornament Exchange Sign-Ups! Love the color contrast with this look, especially with the white trim! Great job Amanda!! Melissa @ Cozy House Creations recently posted…Kids Hand and Footprint Art – Unique, Inexpensive…and Surprisingly UN-Messy! Thanks Melissa! I was a little worried the vanity would be too dark, but I’m really happy with the colors. Phew! 😉 Hope you have a great rest of the week! Love the vanity color! 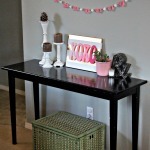 I just used the Behr Marquee paint in some of my house renos and loved it. 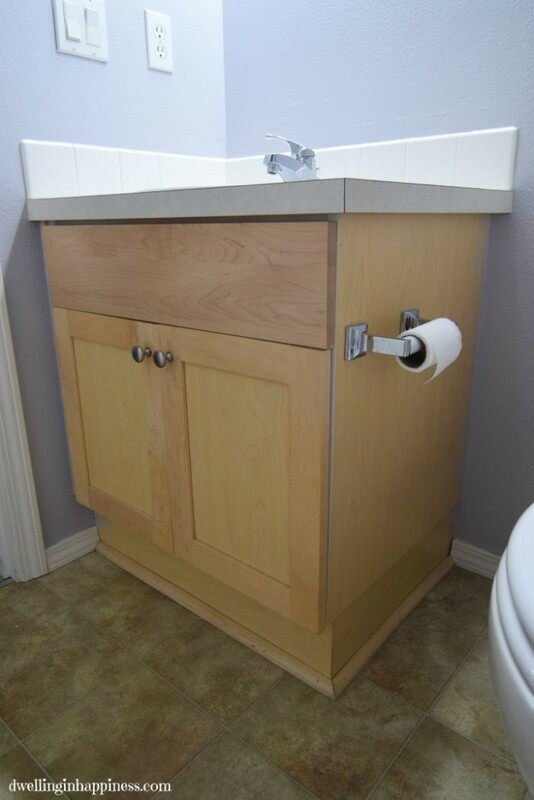 What color did you use for the vanity? I just ran across your page and love all your ideas! I have a question, does it matter what kind of paint is used if it’s a bathroom with a shower? I so need a vanity makeover ASAP! Thanks and beautiful work on all your pieces ???? Hi Jackie! That’s a great question. I’d make sure you use a paint that is mold-resistant, such as the Behr Marquee or their Premium Plus Ultra, as they resist mildew and water. 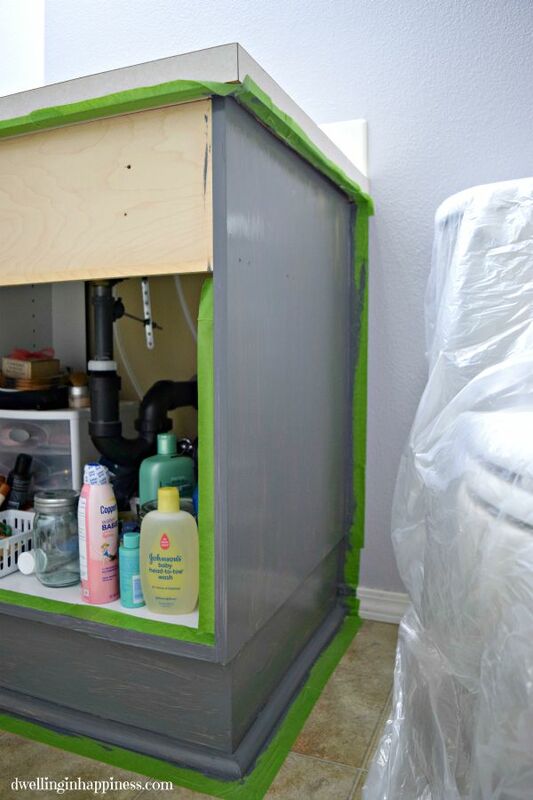 I learned my lesson years ago when I used some cheaper off-brand paint in my bathroom/shower area, and I had mold growing within a few months! Now I only use Behr in my bathroom with no problem. 🙂 Good luck on your vanity makeover!! 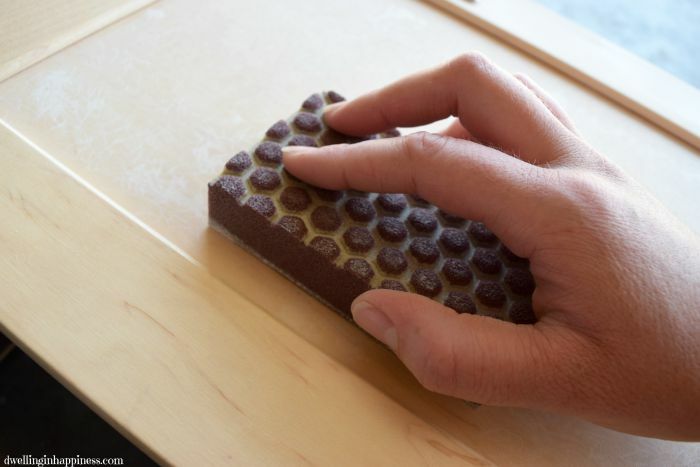 What grade sandpaper did you use to sand the vanity? I am so ready to e same thing. I bet you could scratch that paint off with your fingernail. 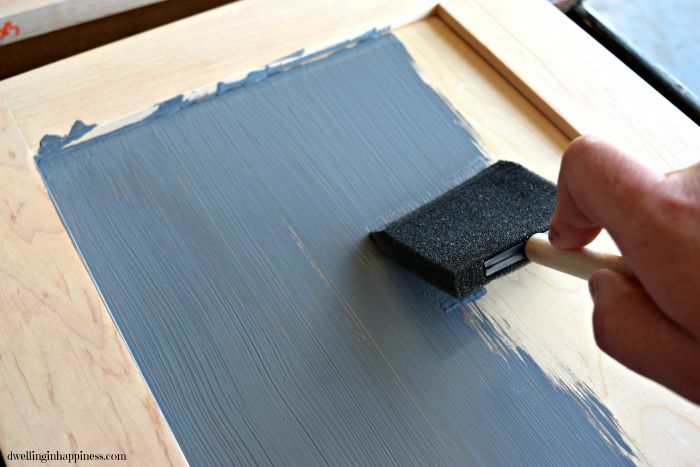 You should have use Reclaim paint which will adhere to any surface without sanding. It’s expensive, but worth it. Hi Mike, unfortunately we have moved homes since painting the cabinets, but I had no problems with any paint scratching off when we lived here. I have not heard of Reclaim paint, thanks for the tip! I’ll keep it in mind for next time! I have reread this post like 3 times (granted with a crying baby on my hip) But I can’t find where you have the color listed. I LOVE it. What is this color?! Hi Margie! Haha, I can completely relate to the crying baby. 😉 I used Antique Tin in a semi-gloss by Behr. 🙂 Hope that helps! Thanks for your input, we fixed them after we noticed it! Hi I am wondering how this paint has held up for you since doing it? Beautiful. What color did you paint on the walls? Can you tell me what color the walls are? Thank you! Hi 🤗 I love the vanity. I just wanted to add something. Majority of paint now a days comes with “primer” in it but it actually doesn’t replace using primer on glossy/slick surfaces or dark colors. It’s just a thicker paint than normal. For something like a vanity that is heavily used, sanding lightly and then painting one coat of primer and then two coats of the color you choose will last much longer and will look great 😍 I’m painting this exact color with some distressing on my vanity mirror and vanity as soon as we finish moving in I can’t wait. Thank you for sharing. Visit website for rev a shelf. 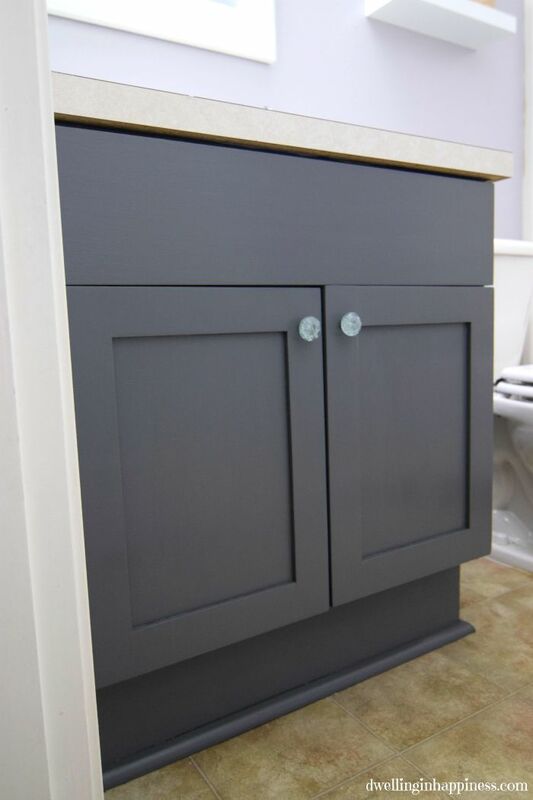 That faux drawer you mention can be a very useful storage place in a bathroom without a lot of space. 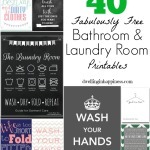 They work great in your kitchen too! There is hardware for tip outs on their site. Wouldn’t be without mine! Hi Rosanne! 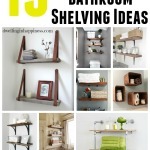 What a great idea, I didn’t know they did that for those faux drawers! Thanks!